Home / Blog / My Rome Away From Home! Hi all! 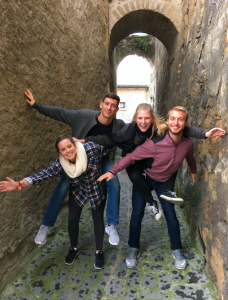 My name is Kate and I spent my whole sophomore year abroad with SAI in Rome, Italy. It was one of the best experiences of my life and I can’t wait to go back. I’ve answered some of the questions I have gotten asked a lot! Orvieto, Italy / We had to run to catch our train but it was worth it for these views! This was at the SAI weekend trip! We did some wine tasting to finish off the day. It’s hard to choose just one memory out of my year abroad! My friends Nick, Sydney, and I went to Budapest for a weekend very last-minute. None of us were expecting too much- just a relaxing weekend at the thermal baths. We ended up booking a caving excursion for a day. It was one of the coolest experiences ever and one of my favorite things I’ve done so far in my life! 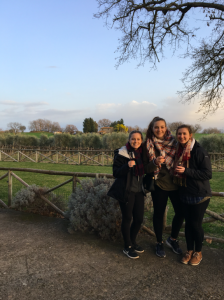 This was a wine tasting at a small town during my first semester! It was an SAI day trip! My favorite class I took was a political science class all about terrorism. The professor, Simoncini, took us through the history of terrorism. It was good to learn about things from a global perspective and not just an America one. He also took us on a field trip to the terrorism conference that was happening in Rome, which was a great experience and allowed us to hear from some of the most knowledgeable people in that field. 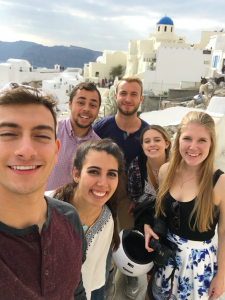 Our last trip together with my first semester friends was spent in Santorini and Athens! My favorite thing to do in Rome was to grab a cornetto, or some wine, and just sit in the piazzas and watch! I would do homework on the steps or just hang out and relax with friends. A lot of Italians were doing this as well and it was a good way to find locals to talk to! 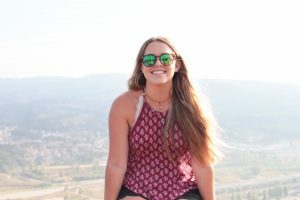 Kate was a 2016-17 SAI Rome student from Saint Mary’s College of California.